Since launching her memoir Becoming last year, Michelle Obama has naturally been making the most of it by donning gorgeous ensembles for the press tour. She completely knocked our socks off in a head-to-toe white pantsuit during her Los Angeles book tour last year November and now, the former FLOTUS has taken her pantsuit affair across the pond for the European Becoming tour in Denmark. Arriving at the Royal Arena in Copenhagen, the former First Lady looked elegant in this pink pantsuit embellished with crystal appliqués. We love the sparkling detailing on this 2-piece, which added a fashion-forward touch to the look. According to the report, the pink-hued ensemble is a design from one of the coolest local brands, Stine Goya. and Mrs. Obama completed the look with a pair of matching heels. 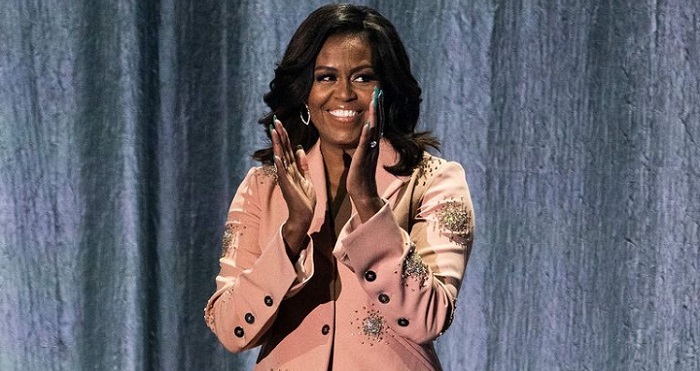 Another report also claimed that the former FLOTUS accessorized the look with a pair of diamond hoop earrings of $16,250, with her blazer costing $1,350, while the pants retail at $960, so we’re asking: what other way to promote her memoir better than this?